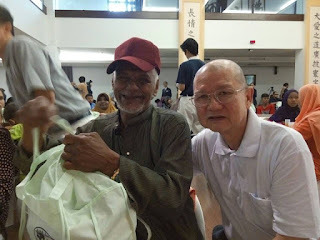 With pachik Yussof on the morning of July 10, 2016 at the Penang Tzu Chi centre for the Hari Raya celebration and hamper distribution. This was my first time. Thanks to Sister Chris Ting Sing Poh for inviting me. Pachik Yussof also helps out at the Lumba Kuda recycling and education centre. Why create problems for yourself?